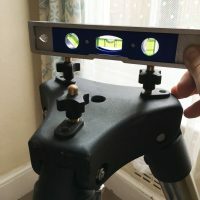 I bought this great grab and go mount from Altair Astro at Kelling Heath star party in 2015. It’s a small alt-az mount GoTo mount with a surprisingly large 14.5kg payload limit, making it great for small to medium refractors, as well as for 8″ Catadioptrics like the Mead LX90 ACF that I use with it quite often. 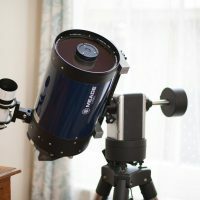 I bought it as an alternative to the HEQ5 for visual and electronically-assisted astronomy, when the bulk of the Skywatcher mount can be a bit of a hinderance to portability sometimes. The whole lot packs down into a single flight case, apart from the (surprisingly heavy duty!) 2″ tripod. That includes the mount, as well as everything that goes with it, such as the cables and counter weights. 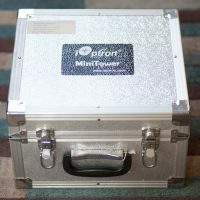 It can be powered by AA batteries, but to be honest I’ve never bothered and just run it off the normal 12v battery or PSU I use for everything else. It has built-in GPS for location and time setting, and the handset is far superior to those that come with most other mounts in that it has about 8 lines of LCD text, meaning a lot more can be fit on-screen at once. 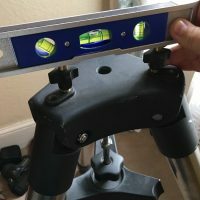 Once you’ve done a 1 or 2 star alignment, the GoTos are surprisingly accurate, just make sure you level the tripod before putting the mount in first for best results (best done with a spirit level like in the pics, rather than using the frankly useless bubble level built-in). 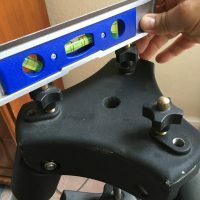 If you level the thumbscrews before putting the mount on top, it ends up perfectly level. 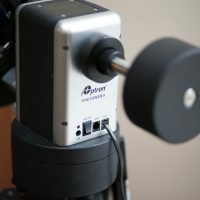 It’s a great mount that, whilst not as heavy duty and steady as the HEQ5, provides a very good base for the majority of non-imaging purposes. 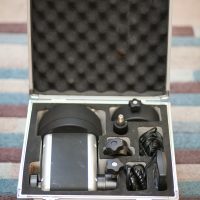 I’ve had various scopes on it, from small and medium 79-102mm refractors, to my 8″ Meade LX90. You can even mount a second smaller scope in the opposite side to the main one in place of a counter weight if you want, though I’ve never done this myself up until now. All-in-all a nice Portable mount that does it’s job well.